I've got to confess something. I've always been partial to the werewolf. There must be something about the wild animal that struggles to break through the exterior of contemporary, mild-mannered man which speaks directly to me. I'm afraid my close friends can confirm it probably speaks to the nebbishy fellow that they all know so well. Which means when it comes to the werewolf movie, I'm, unfortunately, not able to be objective. It's not that I've seen very many. The werewolf movie has long been underserved in horror cinema. And many of them smell like stinkers from a mile away, like the Underworld flicks, the Twilight flicks, Cursed (2005), Teen Wolf (1985), etc. I even tried to sit through Silver Bullet (1985) the other night, out of my respect for Stephen King (he did write the screenplay, based on his own novella), but not only did I fall asleep a half-hour into the film; my wife confirmed that I guessed the identity of the mysterious wolf in question before I started to snooze. Ah, but when you get a great one like The Wolf Man (1941), Curse of the Werewolf (1961), The Howling (1981), An American Werewolf in London (1981), The Company of Wolves (1984), Ginger Snaps (2000), or Dog Soldiers (2002), the violence by the usually sympathetic werewolf against his often deserving victims can be quite cathartic and entertaining. Chalk it up to the vengeful geek inside of me that used to get bullied around. So even when a werewolf film is intriguing if not well executed like Mike Nichols' Wolf, it's good enough that it gets a pass from me. Back before its release, Wolf looked promising enough. It starred Jack Nicholson, a man whose real-life persona connotes a dark sexuality and animalistic appetites. And he would be directed by one of his most penetrating past directors, Nichols (The Graduate), who had so effectively explored Nicholson's darkness in Carnal Knowledge (1971). Nichols was even reuniting his technical crew from Knowledge, the great cinematographer Giuseppe Rotunno (Amarcord) and editor Sam O'Steen (Rosemary's Baby). In many ways, the film that emerges seems to trot through the same territory as that explored in these men's original collaboration. Like in Carnal Knowledge, Wolf explores the social expectations that bind us to a civilized community. In Carnal Knowledge, those expectations are viewed strictly within the sexual arena of society. Wolf looks at the role of civilized man and his obligations to the collective social contract. However, where Nicholson's earlier character, Jonathan, takes a dim, cynical view of any binding social contract—believing it is simply a self-imposed form of control that should be rebelled against—his Wolf character, Will Randall, is older, more conservative, respectful to the point of passivity even when his protege, Stewart (James Spader) steals his promotion out from under him. This setup takes us down a path that werewolf films seldom have, exploring the nature of contemporary man in an urban jungle, making the case that a little werewolf is not a bad thing to have growing inside of you. The problem comes when traditional werewolf legend doesn't cooperate with you. Randall doesn't simply turn into a werewolf when the moon is full. He is slowly becoming more savage each night until the full moon, when he will completely lose his humanity and become a wolf. The effect is envied by some, such as a wizened old doctor (Om Puri) that sees the opportunity to become youthful again if Randall will simply bite him. But despite his affliction, Randall is still too observant of social convention to bring himself to do that. Randall does take advantage of his newfound youthful vigor in pursuing the his boss's beautiful daughter, Laura Alden (Michelle Pfeiffer). She demonstrates how navigating society can be much easier when one learns to use their wild streak wisely. When cops (one played by Richard Jenkins long before Six Feet Under fame) come looking for Randall to question him about his wife's (Kate Nelligan) murder, Laura is able to manage the situation efficiently, a holdover from her wayward youth as the "poor little rich girl" spent dealing with arrests for petty crimes. All of this makes for some engaging performances, layered with both psychodrama and light comedy, that allows Nichols to explore the themes of civility vs. natural selection, survival of the fittest, and all of that. Rotunno finds motivation to enhance the actors' natural allure in the werewolf legend mumbo-jumbo, since the three principals are all exposed to the "effects of the wolf." Pfeiffer has never looked more resplendent. Spader has never used his smarmy delivery to such charming effect. And Nicholson, through some extremely subtle effects like a slowly advancing hairline, almost looks young again. The biggest problem this movie has is that someone (the studio, I imagine) insisted that this film adhere to traditional horror conventions. 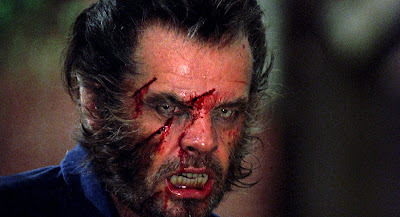 Despite outstanding makeup effects by the werewolf makeup expert, Rick Baker (An American Werewolf in London, the upcoming Wolfman), the movie crumbles whenever it focuses too closely on the "creature feature" aspects of the story. The entire third act falls apart under the rickety weight of the inconsistent mythology presented in the film. Rotunno's lyrical shots may make this one beautiful film to look at, but his inexperience with action sequences make fight scenes hard to stomach. I haven't had an easier time spotting stunt doubles since the days when I watched sixties television brawls on Bonanza or Star Trek. Scenes are obviously edited out of sequence in order to strengthen what was probably an even weaker film. You can tell because sequences where Randall looks more wolf-like precede others when he still hadn't become so bestial. And notable character actors like Prunella Scales and Ron Rifkin make cameos that seem like amputated non-sequiturs, failing to deliver on the promise of reappearances later in the film. One could blame O'Steen for this I suppose, but it seems like he was trying his hardest to appease higher-ups who wanted less introspection and more scares. I recently purchased Wolf—along with Bram Stoker's Dracula (1992) and Mary Shelley's Frankenstein (1994)—in an economical set of Blu-rays I found at Wal-Mart for $39.95, and the film is interesting enough that I would recommend it as part of this set that includes the two other vastly superior films. Like with Frankenstein, the Blu-ray does not contain any extras. I find that this is a missed opportunity for some interesting behind-the-scenes extras considering the changes this movie must have gone through on its way to the screen. The picture does look and sound better than it ever has on video before. But beware, this one is for werewolf, Nicholson or Nichols fans only. I think you hit the nail on the head with this one - great performances from the leads, beautifully shot, plays with the idea of Nicholson's inner beast so well...and then falls about in a ludicrous action-packed third act. It's been a long time since I've seen it, but I still remember James Spader's enormous jumps in the air. Can't wait until you get to DRACULA, one of my favorites!